OPPORTUNITY OF A LIFETIME! MAJESTIC 51+/- ACRE GATED WATERFRONT ESTATE FEATURES A BARN, 2.2 ACRE SPRING FED STOCKED POND WITH IT'S OWN DOCK AND BEACH, MULTIPLE CREEKS & NATURE PATHS.... PLUS 2 MAGNIFICENT 10,000+ SQ FT ESTATE HOMES, each with a grand open design, 2 kitchens, 7 king en-suites, theater, full gym, ultimate billiard/game room, pub bar, handcrafted cherry cabinetry & flooring & full in-law suite! Incredible commercial kitchens, each with granite/solid surface counters + center gathering island, Dacor, Bosch & Kitchen Aid appliances + dual 48" refrigerator & freezer! Car buff's dream with parking for 8+ cars! Perfect for a family compound, B&B, weddings or rehabilitation center! Property is platted for 2 additional homes also! RARE FIND! 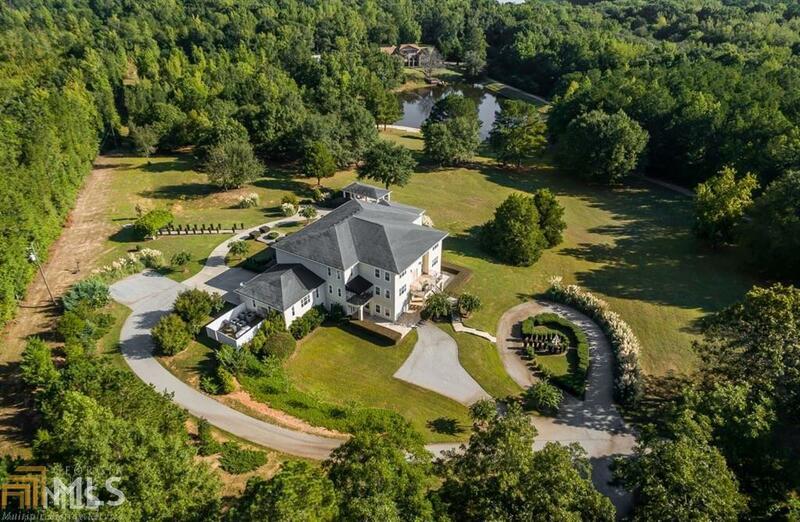 Feature Name Two Magnificent 10000+ Sq Ft Homes Perfectly Situated On Private Gated 51 Acre Waterfront Estate W/Gorgeous 2.2 Acre Spring Fed Stocked + it's Own Dock And Beach! "Nature Lover's Paradise" Enhanced By 3 Creeks Walking Trails Fruit Trees & Orchard! Listing provided courtesy of Berkshire Hathaway Homeservices Georgia Properties. © 2019 Georgia Multiple Listing Service, Inc. All rights reserved. Information Deemed Reliable But Not Guaranteed. © 2019 Georgia Multiple Listing Service, Inc. All rights reserved. The data relating to real estate for sale or lease on this web site comes in part from GAMLS. Real estate listings held by brokerage firms other than Buffington Real Estate Group are marked with the GAMLS logo or an abbreviated logo and detailed information about them includes the name of the listing broker. IDX information is provided exclusively for consumers' personal, non-commercial use and may not be used for any purpose other than to identify prospective properties consumers may be interested in purchasing. Information is deemed reliable but is not guaranteed accurate by GAMLS or Buffington Real Estate Group. Data last updated: 2019-04-23T16:52:39.697.